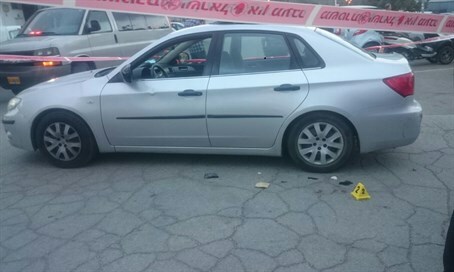 Stabbing attack takes place outside a popular Rami Levi retail chain in the Gush Etzion region. An Israeli woman was moderately wounded in a stabbing attack on Wednesday afternoon, which took place outside a branch of the Rami Levy supermarket chain in the Gush Etzion region of Judea, south of Jerusalem. The attack took place at the store branch located at the Gush Etzion Junction, where there is a sprawling shopping area that includes a gas station which also employs Arab workers, a garage, fast food shops, a bakery and a health food store, among other establishments. It is normally full of cars and shoppers of all ages. Initial reports indicate the victim was moderately wounded and received medical treatment from Magen David Adom (MDA) crews at the scene. She has since been evacuated to Shaare Tzedek Hospital in Jerusalem - with the knife still embedded in her back, according to reports. The terrorist was arrested and taken in for questioning. Senior MDA medic Wally Walpastel said, "when I reached the place we saw a woman in her 40s sitting in a car, fully conscious and suffering from a stab wound in her upper body. People at the scene said they put her in the car after she was stabbed by the terrorist." "We provided her with initial medical treatment aided by the IDF medical corps who arrived immediately to the site, and after quick initial medical treatment on the scene she was evacuated to the hospital in a moderate and stable condition." Just two weeks ago Rami Levy decided to remove knives from the shelves of his store branches in an effort to avoid stabbings. The store has been sharply criticized for employing Arabs, particularly after an Arab terrorist stabbed two Jewish shoppers at a Rami Levy branch in Mishor Adumim to the east of Jerusalem last December. The terrorist apparently was aided by an Arab employee who gave him the knife he used to moderately wound the two. Less than an hour before the stabbing in Gush Etzion, an Arab terrorist was shot dead by IDF forces after attempting to stab soldiers in the Tel Rumeida neighborhood of Hevron. The terrorist did not succeed in wounding any victims.